If the MDR-ZX330BT was a little more durable and traded a few hours of battery life for a richer sound, it might've been one of the best mid-range set of cans on the market. Finding a true compromise, one in which everyone wins, is an art. It's hard to get a sound quality that rivals the Oppo PM-3 in a headset that you can wear all day long for less than the cost of high-end floor speakers. Unfortunately, what we see all too often in the world of technology are endless win-lose situations. 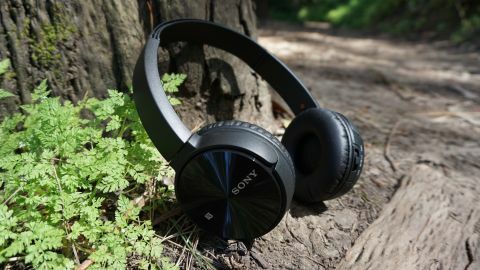 Sony's $99 (£70, or about AU$130) MDR-ZX330BT does a lot right – it's cleverly designed, light, comfortable and has a 30-hour battery life – but all that comes at a steep cost. It's just not a great-sounding or great-feeling headset. But, let's start with the positives. Update: In the year and a half since the Sony MDR-ZX330BT were first released, wireless headphones have exploded onto the mainstream thanks to the removal of the traditional headphone jack from many flagship smartphones. If you want to see the best that wireless headphones have to offer then you should check out our guides to the best wireless headphones, the best wireless earbuds, or even our guide to the best 'true' wireless earbuds. Alternatively, read on for our thoughts on the Sony MDR-ZX330BT. Aesthetically speaking, the MDR-ZX330BT, the little brother to this year's mid-range ZX770BT and ZX770BN, is genuinely good-looking. A simple all-black shell houses two 30mm drivers with a plastic, unpadded bridge spanning the two cans. The ear cups themselves are a bit tight on the ear, but overall are plushy enough to wear for a few hours on a flight if the need should arise. A set of standard controls and a volume rocker are found on the rim of the right driver, alongside a microUSB port that's used for charging and the built-in mic for phone calls. The left driver, on the other hand, rocks a built-in NFC chip. Pairing the device is a quick and painless process (either over Bluetooth or NFC) and should take but a few seconds to set up. Where Sony's MDR-ZX330BT falters in design is that it's, unequivocally, one of the cheapest-feeling mid-range headsets around. That has to do, mostly, with the unpadded plastic bridge that connects the two ear cups and the overall lightness (the headset weighs in at an ultra-light 150g). Frankly, the ZX330BT isn't something we'd feel comfortable tossing into a bag with a heavy 15-inch laptop and taking along with us on public transportation. Should you find a safe environment to use it, however, the ZX330BT will surprise you with an ultra-crisp sound. That said, the headphones lacks the overall depth and richness that higher-end headsets offer, but for a 150g pair of 30mm cans, we can't complain much. The shallow sound lends itself to more songs in the rock and country genres rather than anything in the bass-driven rap and electronic arenas or detail-rich classical music. Now, sound quality will vary depending on your source – Tidal at 1,411Kbps is going to sound much better than Spotify does at 320Kbps and worlds apart from Pandora's 128Kbps. The good news in all this is that, thanks to its 30-hour battery, you'll probably go a week (or more) in between charges. After fully charging the headphones and listening to them for a few hours straight, we inadvertently left them untouched for two weeks. The next time we picked them up, they still had charge and were ready to play music without so much as a flash of the ominous red light of death. When every device today comes with its own proprietary charger and what seems like a 60-minute battery life, it was both surprising and elating to find a pair of headphones that didn't succumb to either. Sony's MDR-ZX330BT feels like an entry-level pair of headphones. They're flimsy. They don't sound as full as other $100 headphones do. They don't have any special features to set them apart from the competition. They're riddled with design compromises that make it a middling offering instead of a truly trendsetting headset. But, while they won't win any awards for being the sturdiest headset ever constructed, they're also incredibly light and comfortable. At 150g, they won't feel like a weight on your head and while they can be a bit tight around the ears, the earpieces are more or less as comfortable as unpadded headphones can be. But, for $99 (£70 or about AU$130), the Sony ZX330BT don't break the bank. If you're looking for a no-frills, wireless pair of headphones with stellar battery life, this could be a solid purchase. Just shop around a little more first, eh?